Vijaya Bank’s Aravind (in white) scores two of his team high 25 points against NGVBC. In the upset of the tournament so far, club side Koramangala shocked Hindustan Aeronautics Limited (HAL) 62-59 to go through to the semifinals. This late night nail biter of a game saw multiple lead changes. Koramangala led in the early goings, but predictably HAL came right back and led by as many as 12 points at the end of the third quarter. If one were to go by history, not many would have predicted Koramangala to find the extra energy reserves for a final assault in the last 10 minutes. 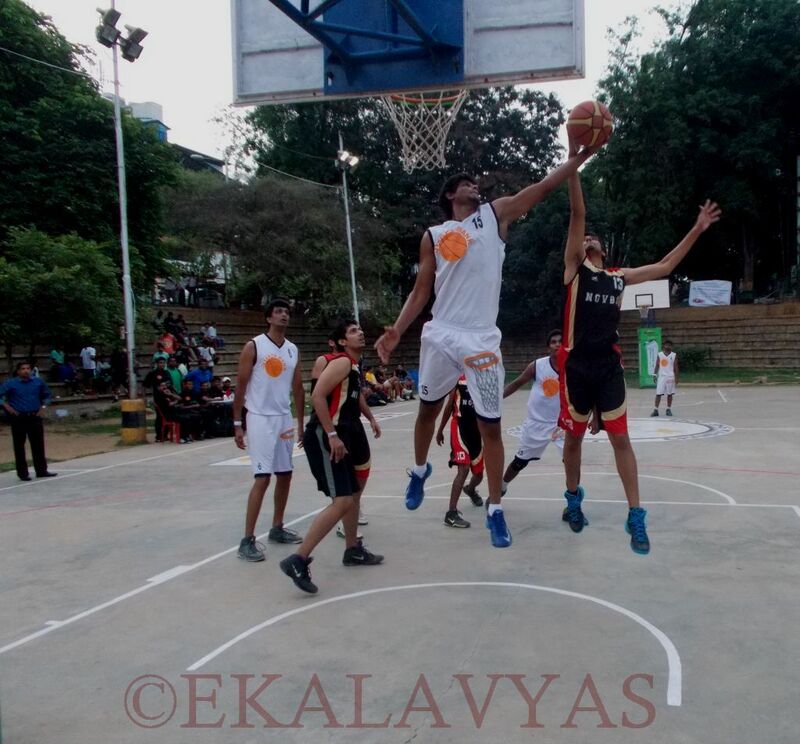 However, a never-say-die Koramangala led by the sharpshooting Abhishek John and Abishua connected repeatedly from long distance to close out this memorable win. Young Orions too continued their winning ways by putting it across hosts JSC, in a surprisingly one sided match. Guards Yashas and Agu top scored with 22 and 19 points each for Young Orions. Kaif (12 pts) and Varun (11 pts) led their JSC side in its below-par effort. In the two remaining men’s quarterfinals yesterday, heavyweights Vijaya Bank and Corps of Military Police easily advanced to the final four after beating National Games Village Basketball Club 73-47 and Beagles respectively. Vijaya Bank and CMP’s superior experience, athleticism and size meant that their Club opponents stood no chance, despite their spirited performance. Vijaya Bank led 37-29 at halftime and pulled ahead in the second half to finally win by a 26 point margin. In the second quarterfinals, Corps of Military Police (CMP) beat Beagles BC 66-47 after leading 38-18 at halftime.